If you can’t see what’s on your network, then you can’t control it. As new technologies emerge each day, so do the associated security threats - are you confident that you can see them before they wreak havoc on your network? 86% of executives aren’t, believing there are gaps in their ability to see what’s really going on inside their network. 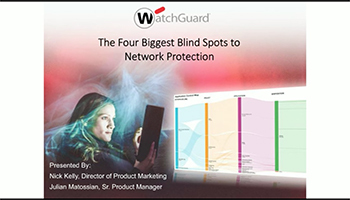 Join Julian Matossian, Senior Product Manager, and Nick Kelly, Director of Product Marketing, as they delve into the current state of network visibility: the challenges, blind spots, and most importantly, the solutions to help illuminate your network. Having the right security measures in place is only half the battle – you need to know exactly what they’re protecting you from.